Magdalys and the squad are flying south on pteroback. South to rescue her older brother. South to war. 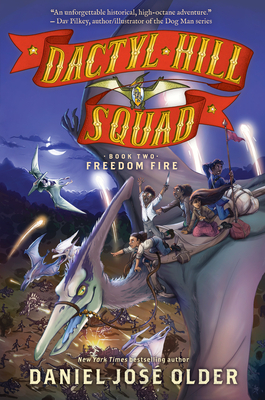 The squad links up with the dino-mounted troops of the Louisiana Native Guard, an all-black regiment in the Union Army fighting to free their people. They're led by General Sheridan, surrounded by enemy forces in Tennessee and desperate for any edge to sway the tide of battle. Magdalys's burgeoning powers might be the Union's last hope. But she doesn't want to abandon the search for her brother. And she might not be the only one with a mysterious connection to dinosaurs. With the Civil War raging around her and the Union on the brink of collapse, how can Magdalys choose between the army that needs her help to survive and the brother she risked everything to save?